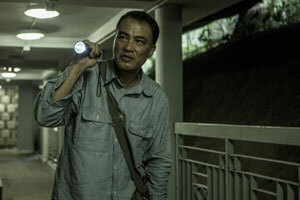 (left) Simon Yam, and (right) Lo Hoi-Pang and Siu Yam-Yam in Tales From the Dark 1. The Skinny: Uneven trio of "classy" horror stories from Edko Films works about 50% of the time, meaning one story is good, one is bad and one just so-so. Tech credits and actors (minus Kelly Chen) are fine, and the final story from Fruit Chan ends the whole thing on a high note. Followed by sequel Tales From the Dark 2.
by Kozo: Horror films return to Hong Kong – and hey, now they’re classy. At least, that’s what Edko Films is pushing with their Tales From the Dark duology, two horror omnibus films offering three short stories each. The credits certainly signal class. All the stories are based on the work of author Lilian Lee, whose writings have inspired Farewell My Concubine and Green Snake, among other films. The Tales From the Dark duology also boasts noted if not acclaimed directors, with the first film listing Lee Chi-Ngai (Lost and Found) and Fruit Chan (Made in Hong Kong) as segment directors. The third director is Simon Yam, who’s better known as that guy who appeared in Dr. Lamb and Election. Yam knows a thing or two about acting scary, so calling upon him to direct himself, Maggie Siu, Yuen Qiu and Lam Suet seems like an inspired idea. At the very least, the Yamster’s acting is guaranteed to entertain. It does, though not enough to lift Yam’s segment to notable heights. In “Stolen Goods”, Yam plays Kwan, a low-income laborer whose temper and general unpleasantness cause him constant unemployment. Grousing about his inability to pay for his food and lodgings, Kwan decides to steal cremation urns from their resting places and ransom them for money. Obviously, this won’t end well. Yam tells “Stolen Goods” with minimum exposition and plenty of ominous atmosphere, creating minor suspense but not much else. This is a suitably creepy yarn that’s decently developed, with details that may resonate with Hong Kongers who recognize Kwan’s particular hardships. Unfortunately the segment is rather one-note, and lacks the rising suspense or richer details to drive it to an affecting close. There are no surprises in the acting; Yam is convincingly disturbed and slovenly, and even takes a moment to briefly dance “Gangnam Style”. That may actually be the scariest moment of “Stolen Goods”. “A Word in the Palm” is also not very scary, and that’s not the worst thing about it. Lee Chi-Ngai scripts and directs this disappointing tale of fortune teller Master Ho (Tony Leung Ka-Fai), who investigates a mystery involving a teenage ghost (Cherry Ngan) who’s haunting her former swim teacher. “Word in the Palm” has its creepy moments but they play second fiddle to the sight of Tony Leung bantering endlessly with Kelly Chen, who plays Ho’s colleague Sis Lan, a New Age crystal seller with a loopy demeanor that marks her as an obvious shyster. Chen’s acting is barely sitcom worthy, and she isn’t helped by Lee’s talky script, which explains its attempts at horror and pathos with almost startling banality. There’s also an extra storyline about Ho wishing to give up fortune telling to please his estranged wife (Eileen Tung), but it generates only minor interest. One of the original creative forces behind seminal 90s film studio UFO, Lee Chi-Ngai has seen better days. Fruit Chan rights the ship with the third segment “Jing Zhe”. Siu Yam-Yam stars as Chu, who makes a living performing Da Siu Yan or “Villain Hitting”, a folk sorcery where a person curses their client’s “villains” by repeatedly hitting human-shaped papers with a shoe. The practice is akin to exorcising demons, and is frequently performed on Jing Zhe, a particular period of the lunar calendar and the inspiration for the segment’s title. 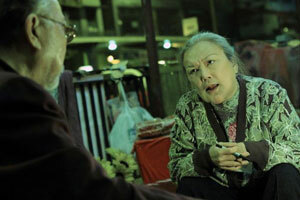 Chan’s segment provides initial dark and also satirical laughs, as Chu performs Da Siu Yan for two customers (Josephine Koo and Lo Hoi-Pang). The tale turns, however, when a young woman ghost (Dada Chen) shows up to request Chu’s service, leading to the slow realization that very bad things will soon happen. “Jing Zhe” is not very scary either, but the script is smart and Chan sharply creates the sort of tension and audience expectation that can carry whole films. Long absent from Hong Kong Cinema, Fruit Chan shows he’s still got it and then some.